Striker Scott Vernon admits he remains in the dark over his Aberdeen future, despite hitting a hat-trick to see off Dundee United on Tuesday. 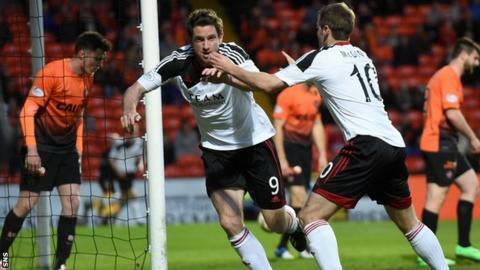 The Englishman, 30, took his tally to nine goals for the season in the Dons' 3-1 triumph at Tannadice. He is out of contract this summer after four years and has yet to be offered a new deal by manager Derek McInnes. "I don't know what's happening next year - nothing has been said yet," Vernon told the club's website. "The gaffer has got a few decisions to make with the boys who are out of contract and I'm one of them. I will just have to wait and see." Vernon also bagged a treble as the Pittodrie men hammered Falkirk 5-0 in the League Cup in September. But he was given a scare on Tuesday night when he rolled the ball towards an empty net for his third as United defender John Souttar made a desperate late bid to clear the ball off the line. "For the third goal, I didn't actually know Souttar was behind me, so I just thought I had to tap it into the empty net," Vernon added. "I didn't want to risk it by taking the leather off the ball because it was bobbling up a bit. "So my heart skipped a beat when I saw him run in, but then I heard the fans go wild, so I was a bit relieved."